Discover interesting facts and information about the weapons, including the Knife and Dagger, used by Native American Indian tribes. 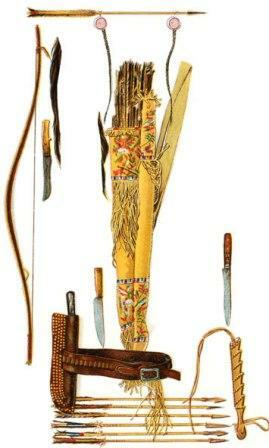 A knife or dagger was always carried by the Native American Indian. They varied in size and would be held in a sheath at their side or small knives were hung around the neck. The normal blade is the most common heavy, strong knife and has a curving edge, and straight back, ideal for cutting and thrusting. The curved blade light weight knife has a back edge that curves upward, ideal for slicing or slashing and as skinning knives. The large knife that has a drop-point blade that is thick and strong. The knife with a spear point blade has a central spine and is double-edged like a large dagger or a spear head. The spear point is one of the stronger blade point designs and ideal for penetrating targets and used as a thrusting knife, like the dagger. Some types of throwing knives have spear point blades, but these are commonly made flat, without a spine. The dagger is a thrusting weapon and fighting knife. Its long, narrow point reduces friction and increases the blade's penetrative capabilities, but is liable to stick in bone and can easily break. This type of blade has a straight edge and a straight dull back that curves towards the edge at the end. It gives the most control, because the dull back edge is made to be held by fingers. The back edge of this thick blade starts closer to the handle and is more gradual. 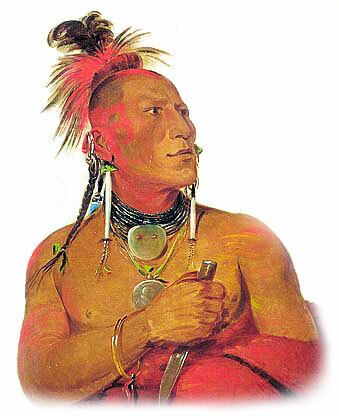 The Knife and Dagger was carried by Native Americans in Knife Sheaths held at their sides or carried around their necks. 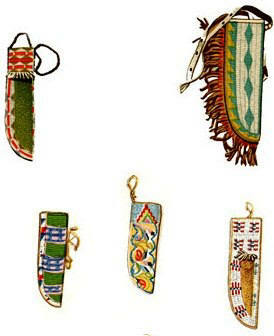 The following picture shows some examples of Native American Beaded knife sheaths. Native American Weapons. Discover the interesting facts and information which relate to the History of Native Americans and the weapons they used such as the Knife and Dagger. The pictures on this site show the weapons and tools that were used by various Native Indian tribes that can be used as a really useful educational history resource for kids and children of all ages. 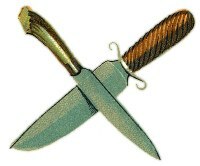 We have included pictures and videos to accompany the main topic of this section - Knife and Dagger. The videos enable fast access to the images, paintings and pictures together with information and many historical facts. All of the articles and pages can be accessed via the Native Indian Tribes Index - a great educational resource for kids providing an unusual insight into their culture. We hope you enjoy watching the videos - just click and play - a great resource for gaining facts and information about the life of Native American Indians.